Project taken on by RAWR-Designs. Live 2, updates and future Live-related projects has been suspended until I finish my thesis. Sorry for unattend your requests. Greetings, Alvaro. Check this first post to download new updates. 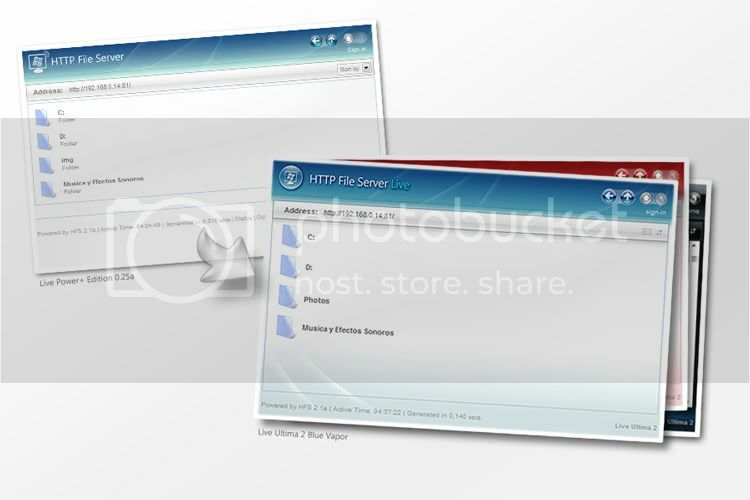 Live 2.104 Images are hosted by photobucket. Live 2 CSS and JS hosted by Geocities. If you have problems accessing Live 2 remote files download Live 2 Local. Unzip it and add the "hfslive" directory into the root of your hfs. 18.10.08 Added Windows Skydrive as main server. 29.07.07 USER SUBMITED: ITALIAN Live Ultima Blue 2.205 (by fabnos) added to first post and Live Update Server. [Added] Live Stream, Listen your MP3's without download them in a new window. [Fixed] PSP Support!! Live will detect your PSP system and will display for it withou entering to delete nothing on the code. [Fixed] Icon replace, 100% stable. 16.04.07 Finally Live 2 (All editions) Open to public, enjoy!. Update change Logs will show here. 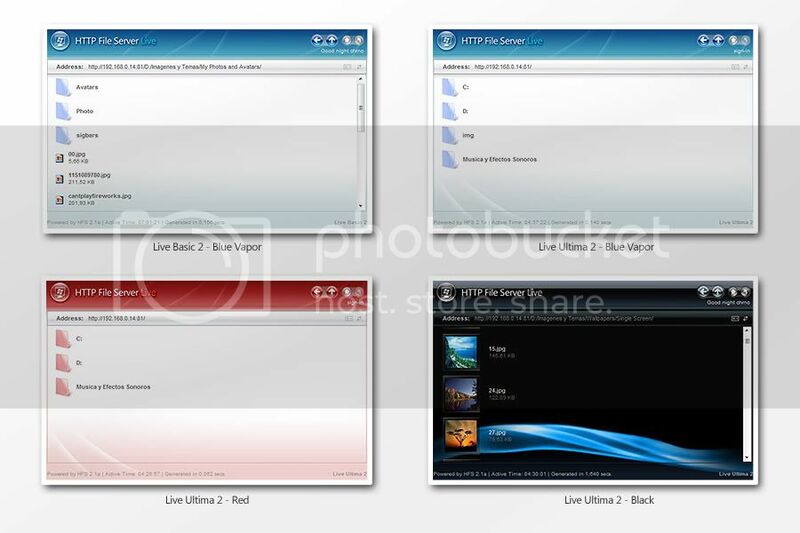 - In PSPs Live 2 (All versions) have a little graphical glitch in the top image. It’s queued for Basic updates. - In PSPs (All versions) some JS doesn't work (show/hide things) because a partially implemented CSS in all the PSP, this can't be solved by me is just a warning. - In firefox (Ultima versions) when click in send url to a friend and go to another page the send url window disappears, this is a problem between CSS and JS, queued for next update. - In all browsers (All versions) when sending very small files (kilos or bytes) Live upload never changes (or takes more than the usual. Before cancelling check if the file was uploaded (by browsing in Live) if so, close the Upload window. I can't see an explanation. You were very professional in the presentation of your "Live 2" in this thread. Good Job! I'll have to take a look at your new template. The template is damn great! Also i have to say, you present your templates very well on the forum. I just don't have the time to post up the ToG like that! its very impressive I'm too busy making stuff for my university projects. Do you want me to update the HFS live download info in Share Templates?? If so just send me the data u need me to input, i'll also update my database with your templates. Traxxus, he probably exported with a build before 86... i had this problem aswell. If not, its something else, just copy/paste from notepad. I used an external server (for the photos) for many reasons: the first one is to not use you own server bandwidth, I thought closely in low- bandwidth users and every kilo for them is usefull so they should don't carry about wasting bandwitdh with just some "nice" images. The second reason is related with the cache, for some reason when using images in the img folder (using HFS) the photos always reloads when jumping from page to page, this is really annoying and wastes bandwidth. The third reason is to speed-up the first load. Insted of waiting just for one server to send all the data, two servers simultaneously sends all the data in the half of time. The fourth reason is to make Live easier to install, instead of adding special folders and hidding them, is annoying when HFS restarts and you forgot to save your folders, the result is predictible. So those was the four reasons why Live uses externals servers to the IMAGES, CSS AND JS. 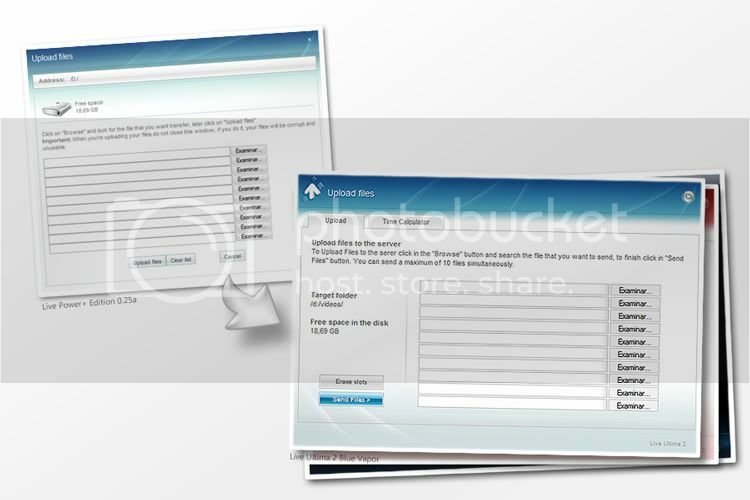 I choose photobucket and geocities because were free and fast alternatives, remember this is a free project so i can't pay for a server for you guys. Stevens! where can i see the 'new' file.ext . I've not to much time to browse through the forum and see all the HFS Changes. hey! could you give me the images cuz i want to upload them to my faster server. Hey thanks, before I send you can you tell me some details of your server. check if your using UNICODE. Open in the template in notepad, if html code appears re-save as ANSII. Any one have the same problem?